There are 4 big gameplay innovations in PES 2017. Firstly you've got the goalies. In previous PES games they've been quite the source of negativity, but in PES 2017 it's a very different story. Suddenly they feel like the players they're meant to represent. Tottenham's Lloris is capable of acrobatic feats, while Bayern Munich's Neuer is all hands and feet as you'd expect. Then you've got the changes coming to each team overall. 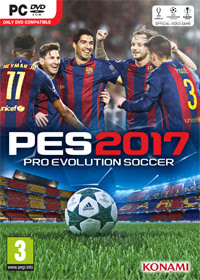 Konami has successfully managed to move the game away from the arcadey style it's known for, making ball physics and player touch to slow the game down and make it feel like you're playing as the team whose badge is on the shirt (or the PES variation of anyway). Statistical attributes and position now really play their part.